Side Note: Deadly Heat is a continuation of the events from Frozen Heat, detailing the second half of the story arc. Information in this review may give away pertinent information that could spoil events from the previous book. It's not that I didn't like it, per se; however, it's not like I really liked it or anything. To be honest, these past two Nikki Heat novels felt like they were trying way too hard to convince me that they are written by the infamous "New York Times Bestselling author." While it's fine and dandy to parallel the television series, maybe there comes a time when the books should try to feel more like books than advertising devices. At the very least, there are certain good points I can come up with even if there were more negatives that managed to exasperate me. The humor is still top notch and I appreciate it a lot. The detective team is cohesive and I'm glad they work together as a unit very well--I certainly love seeing the Roach team (the book version of Ryan and Esposito) doing their work and throwing in their quips. And then there's another random Firefly shout-out that put a grin on my face. The plot of this book could have been solid if only it didn't spend so much time trying to be big and bad and awesome. And if only it didn't hold an almost jokey, comedic narrative tone that made the seriousness of the situations feel like they were hard to take seriously. The Story picks right up from Frozen Heat where we left Nikki's mother's murder solved, but not quite resolved. The espionage plot gets more intense as a bigger, more sinister plot begins to come into focus, and a set of Homeland Security agents seem to be doing whatever they can to either undermine or sidetrack Nikki's investigation into the bigger picture of her mother's murder. Mainly, one agent wants her to join their team, the other one wants her to get out of their way--either way, they don't want her investigating this case on her own. Meanwhile, a serial killer has surfaced picking off random victims who may not be so random after all when Detective Heat and her team find what the connection may be. And to be totally honest, the book had it's enjoyable moments and the conclusion actually twisted together (even if it felt a little forced) in a rather clever way. I welcomed the conclusion of this book and this story arc for two reasons: 1) It brought closure to Nikki Heat's mother's murder case and DID manage to tie up loose ends, and 2) I spent the latter half of the book wondering how much longer it would take to get there. While the Nikki Heat books prove to be rather entertaining, it doesn't escape my notice that, as I stated before, they try way too hard to be "bestselling" material that they end up reading in a rather stilted way. And it also doesn't escape my notice that this book includes only one, singular strong female character... and one competent female side character (for television parallel-sake)... and that's it. 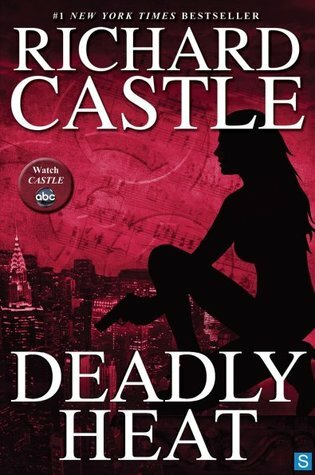 There are no other female detectives who can do their job competently (as presented by the fictional Detective Sharon Hinesburg); all the other strong female characters in this book are either evil or bitchy, creating a massive case of girl-on-girl hate, which created for an unnecessarily awkward and tense atmosphere. And all that is probably for the sole reason of making Nikki Heat seem much more kickbutt and much more awesome than she already is. Except that we don't need to beat down other female characters just to make our super special, super cop look awesome since she does so on her own merit anyway. In the actual television series, Castle, I can count one other female detective who does her job properly and competently without removing the limelight from Detective Kate Beckett. And I can count at least one female FBI agent who may have swooped in on a power play, but ended up getting along really well with Detective Beckett for a common cause--and rather than coming off as "the other woman" or a jealous ex or something else petty like that, we get to see the more common side of her as a mother, a family woman, who happens to have a demanding job in law enforcement who is in a leadership position, no less (which was actually kind of nice, by the way). While this book had its entertaining moments, by the latter half of the story, things felt like they started dragging out. I'm not sure how a book managed to include so much detail, so much forward progress, and so many happenings while still feeling like it took forever to get from point A to point B. I swear, scenes seemed to drag out into forever and one particular scene about Nikki Heat coming upon a murder victim managed to draw out by two pages when one or two paragraphs probably would have sufficed. I know I shouldn't keep making these comparisons between the book series and the T.V. series, but it's hard not to do. The characters in the book really DON'T do the television series character any justice. Granted, I'm a couple seasons behind in parallel with the book series, so I don't know if things have changed. Hopefully the next book in this series picks up a little bit now that a significant parallel story arc has come to a close.